Broner or Berto for Manny before Floyd? 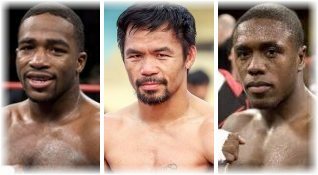 The word is WBA welterweight champion Sen. Manny Pacquiao will stake his crown against either Adrien Broner or Andre Berto, tentatively in Las Vegas on Jan. 19, before he takes on undefeated and “un-retiring” Floyd Mayweather, Jr. in a much-awaited rematch sometime next year. Pacquiao, 39, is now a promotional “free agent” after finally severing ties with Top Rank. Last July, Pacquiao stopped Lucas Matthysse of Argentina in the seventh round to wrest the WBA crown in Kuala Lumpur with Top Rank tapping ESPN+ to make the fight available on livestream in the US. Top Rank, however, had no contract to represent Pacquiao who refused to sign away both the rights of first negotiation and last refusal. Top Rank initially held back paying Pacquiao his fee of $1.7 Million but later relented under threat of a law suit. Top Rank and Pacquiao parted ways amicably with chairman Bob Arum wishing the fighting Senator good luck in the future. Pacquiao also acknowledged Arum’s guidance and support through the years. Pacquiao has reportedly come to terms with Mayweather’s adviser Al Haymon, a Harvard graduate like Arum, on a two-fight deal. Haymon, 62, has been involved in boxing since 2000 but put up his company Premier Boxing Champions only three years ago to shepherd some of the biggest names in the fight game, including Mayweather, Broner and Berto. Broner, 29, has the inside track as Pacquiao’s next opponent. He’s a former WBO superfeatherweight, WBC lightweight, WBA superlightweight and WBC welterweight champion with a 33-3-1 record, including 24 KOs. Broner recently inked a five-fight $50 Million contract with Haymon. Another option is Berto, a former WBC/IBF welterweight titlist with a 32-5 record, including 24 KOs. Berto, 35, represented Haiti in the 2004 Olympics and went the distance in losing to Mayweather in September 2015. Last August, Berto stayed busy by pounding out a split 12-round decision over DeVon Alexander but had to get off the canvas to beat the former WBC/IBF superlightweight ruler in New York. Broner has come out in public to demand a purse of $100 Million to fight Pacquiao but a source said “he’ll come around, that’s the way they usually start negotiations.” It’s absurd for Broner to ask more than what his five-fight deal with Haymon is worth.